Sockdolager's crew enjoys a sail in calm waters. Photo credit: Seaport Photography. Twenty-four hours previous, the thought of being at the mercy of a gale coming with so little warning had caused my mind to briefly race toward panicky paralysis, until I forced it to stop and come to attention. What are you afraid of, I asked silently. Of being smashed by wind and huge seas in these cold waters, the fear answered, of not being in control. Are you afraid the boat can’t cope? No, she’s a solid little thing. Is a 35-knot gale something you can’t cope with? No, I’ve seen them before. Is it because of the reputation of this coast? Yes. The seas are supposed to be worse here. And there are no harbors of refuge. Well, what can you do about it? Stay offshore, reef the sails and heave-to. Secure everything in the cabin that could fly around, and remember you got through a gale in the Gulf of Alaska just fine. What else? Act calm. Keep to normal routines. Discuss all those plans you and Jim made for situations like this. You’ll do fine, I told myself. Rising seas off the Oregon coast a day before we hove-to. Before we’d hove-to we had been running before the wind and seas, an option that might have remained viable except for one thing: a stronger gale was forming to our south, off Cape Mendocino. If we continued sailing south, we would risk running into that at a time when we would also be running out of sea-room on an inhospitable coast. Bad as it sounded, we needed to try and stay put to avoid the stronger gale to the south. Sea-room is like money in the bank, it’s safety. We’d sailed 100 miles offshore as a deliberate coping strategy for exactly these circumstances, because you need plenty of sea-room with a ragged coast from Washington through Northern California forming a dangerous lee shore. Fetching up on surf-tossed rocks is rarely survivable, so the closer we got to the coast, the more nervous we’d get. A beautiful but inhospitable coast, a dangerous lee shore. This is why we sailed 100 miles offshore. Photo credit: Wikipedia. At first we hove-to using a double reefed mainsail and a small scrap of genoa, but we soon rolled up the genoa because the boat was heeling too much and wasn’t heading up enough into the wind. Our mainsail is relatively small, so its second reef is where most sailmakers put a third one. But we were still heeled over too far, and with the tiller hard over the boat still wouldn’t point much higher than a beam reach, so we rigged the storm trysail, hoping that would make the difference. The boat heeled less and we pointed a tad higher, but we remained beam-on to the seas for too much of the time. Here’s a video of Sockdolager hove-to in the early stages of the gale off Oregon. We didn’t get any video of the heart of the gale because it happened at night. We also stayed hove-to for an extra twelve hours because the gale to our south was still blowing, and we didn’t want to run into it. Besides, it was still blowing thirty knots where we were, so why not wait for it to settle. It's worth noting that the lens on the snapshot camera we used makes waves look a lot smaller than they are. Not that we're playing our violins, but when we watched these videos for the first time, neither of us felt that they showed the seas as high as they really were. Also, some seas are cresting in this video, but none had begun to break and tumble. Two more videos follow, further down this post. The idea behind heaving-to is to use the sails and rudder to “park” the boat so it rides at a 45 to 60 degree angle to wind and waves, presenting a relatively small target (the bow) to the seas. Heaving-to stops headway and reduces crew discomfort, so that you can rest, cook and eat a meal, change or reef sails more safely, or do more intricate tasks like connecting to a Ham radio net. Although the change to less motion and noise is immediate, heaving-to doesn’t stop all movement; properly positioned, the boat will drift directly downwind at about half a knot to a knot. Fin keeled boats will make more leeway (slippage sideways) than boats with full keels. As the boat is pushed downwind, the water it passes over smoothes out when it emerges at the surface next to the boat’s upwind side. This is called its “slick,” though no oil is involved. Whether the effect is an apparent increase in surface tension as the boat “combs” through the water and flattens this small patch just to windward, or some other reason, it damps down waves threatening to break over the boat. They’ll break all around, but rarely over it. The trick is to stay in that slick area of water by drifting dead downwind and not moving ahead, out of its protection. 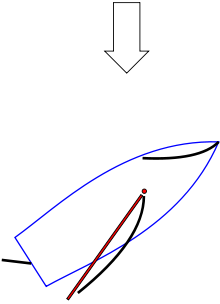 If when hove-to, the bow doesn’t point high enough into the wind, the boat’s sails will fill and cause it to accelerate forward and out of position (called fore-reaching.) A boat that’s fore-reaching will make headway and escape its slick. Note how at the end of the above video the GPS shows our speed accelerating from 0.7 to 2.3 knots. That's fore-reaching. Unless waves are breaking or you are threatened with being blown onto a lee shore, this may not matter a lot. But off this coast you can have both threats, so being able to stop the boat is important. Since we had plenty of sea-room and were to windward of our course line, our goal was to outwait the stronger gale to our south while staying on course as best we could. A windy day and no harbor = stay well offshore! Wind speeds given in marine weather forecasts can often be lower than what you get in reality, and forecasts give sea size as the “significant” wave height, which is an average of the highest one-third of all waves in that area. This means about half the waves will be less than the significant height. But because intersecting wave crests sometimes combine to form higher waves, about ten percent of the seas will be 25 to 30 percent higher than “significant.” One percent will be two-thirds higher, and about once per hour a wave will be almost twice the significant height. So if the forecast says “Seas ten feet,” then you should expect many to be less than that, but also expect ten percent to be 12.7 feet, one percent to be 16.7 feet, and the highest wave you might see is twenty feet. Encountering rogue waves is uncommon but not unheard of, and these can be several times the significant wave height. Where we were, 100 miles off the southern Oregon coast, there was a gale warning and a hazardous seas warning. Thirty-five knots of wind and 11 to 13 foot seas are not an uncommon forecast in the North Pacific. But in this part of that ocean, waves behave differently. They’re steep and nasty. Let’s look at why. At sea you often encounter low, long ground swells, which are not considered wind waves because they formed so far away and have moved beyond the wind that created them. As they travel across an ocean, the distance between crests lengthens, so that a 5-foot ground swell may have a wave period of 13 to 15 seconds. Wave period is the time between the passing of two wave crests. Wind waves are typically 9 to 12 seconds apart. The wave period of a chop is usually from 3 to 8 seconds. Sometimes current will affect waves, making them steeper if the wind opposes it. As a wave train approaches a coast, it can “feel” the bottom, then slow down and stack up much like traffic does. 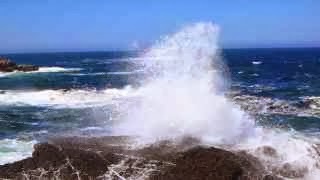 A sudden rise from abyssal depths to a narrow continental shelf like the one that occurs off this coast will also create changes in wave patterns, and if the coast is steep and rocky, waves will refract and boomerang back out to sea. Add to this mix a maze of offshore undersea canyons that can channel currents and wave energy, and you have a more complex oceanographic picture than almost anywhere else. So... imagine having current, bottom topography and open-ocean distances combine to give you big seas with the wave period of a chop. You get boat-stopping walls of water. Many of these waves will have vertical sides. If the wind is strong, some will have foamy crests and a few will be breaking. A sea breaks when its base can no longer support its top, and it collapses, bringing the weight of all that water on top of anything in its path. As a top choice of where not to encounter a gale, this was it. In contrast, an even larger wave off New Zealand behaved itself because it was in a wave field that was well-spaced. 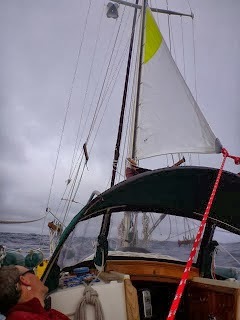 In the gale off Oregon, Sockdolager was alternating between being positioned about 60 degrees off the eye of the wind (good) to going completely sideways to the steep seas (bad.) During the latter phase she fore-reached out of the protection of her slick. That’s when we’d get hit. Breaking waves clobbered us about a dozen times, though none pushed us into a knockdown. “No,” he said. “Stay there, I’ll just sleep on the floor.” He moved some bedding to the cabin sole and lay down, fully clothed and in his foul weather gear, as was I. This was the scenario everyone reads about with storms at sea when it gets too rough to stay in your bunk: you simply sleep on the floor. Except sleeping wasn’t very likely. Jim looked nervous. This was his first gale in the open ocean. Though it wasn’t my first gale, I was nervous, too, but determined to stay relaxed so that I could be rested and ready in case we needed to go into action. I went through all possible scenarios in my mind, and reassured myself that we were as ready as we could be. And we talked about all our backup plans, reassuring each other, because our backup plans were solid. “Remember how you and Brion Toss called the complete replacement of our rigging and chainplates a good offshore sleep aid?” I asked. Jim chuckled and put his head on a pillow he’d wedged between the compression post and the settee. In a strange way, the situation reminded me of the day back in 1983 when, at the helm of a 38-foot Morgan sloop named Dreamweaver, one of two boats chartered for the Connecticut Audubon Society, I was steering toward the harbor entrance of the Dry Tortugas, about 70 miles west of Key West, Florida. We had made the 120-mile overnight passage from Fort Myers okay, but in the long entrance channel to the Dry Tortugas, we got hit by the edge of a waterspout. Figure those odds. 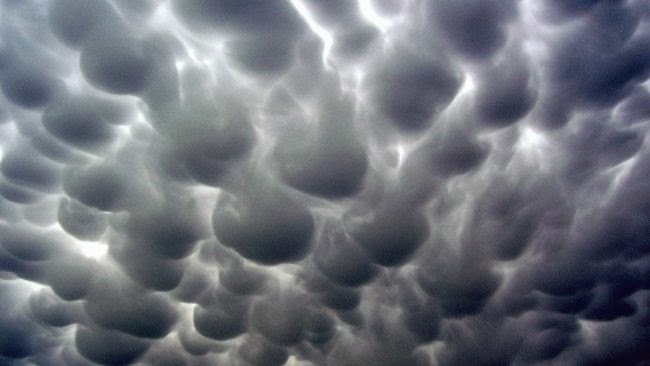 Cumulonimbus mammatus clouds, precursors of waterspouts. Photo credit: NOAA. Three squalls in a row hit us, with the Coast Guard station on a nearby island measuring maximum gusts of 80, 90, and 100 knots. While I stayed topside steering through them, I tried to look calm, because I could feel five pairs of wide eyes closely monitoring every fleeting expression on my face. It made me think, they’re looking to me for clues. If I stay calm, maybe they will, too. There really wasn’t time to be afraid, because I was too busy. Everything got chaotic and it was impossible to see where we were going. I was trying to keep the boat from going onto a reef by steering southeast, back toward open water. My sense of direction became completely disoriented, and I wanted to steer where I thought we had come from, by feel, but the compass said I was wrong. I knew any mistake would put us on a reef, so I quietly chanted a mantra: Southeast is safety, southeast is safety. Trust your compass. You’ll be alright if you trust your compass. Lucky for us, the wind was from the northwest. The fourth squall hit while we were running before it under bare poles. The Coast Guard station a few miles away recorded 110 knots. There was no way heaving-to would have worked on a fin-keeled boat caught between two long coral reefs. I heard a train-like roar coming up behind us, felt the wind and rain pin me to the steering wheel, felt the boat going over, and saw two of the passengers, braced inside the cabin with arms and legs spread, appear to do cartwheels in place. Our speed dropped instantly from 10 knots to zero as the masthead splashed into the top of a wave, and I braced for collision with our buddy-boat bearing down behind us, a Cabo Rico 36 also going ten knots. Somehow, the other boat’s skipper sensed something wrong, and managed to turn his boat away from our path. We later surmised that the waterspout had passed between us, brushing (or possibly hitting) Dreamweaver. I felt Dreamweaver’s cockpit filling with warm seawater, and watched the companionway hatch boards slide out of their slots and go floating off into the sea. The sight of these wooden hatch boards blithely on their way elsewhere brought some sense into the senseless derangement of our situation. Here is something we can do. In the howling wind I pointed at them and asked the leader of the group, “Would you mind grabbing those hatch boards? The owner will absolutely kill me if we lose them.” He gave me an incredulous look but quickly reached over the coaming and got them. Somehow this must have been the right thing to say, perhaps because it forced us all to focus on such an ordinary task as retrieving and passing the hatch boards below, to be secured. When the powerful gust subsided and the boat snapped upright and no more mammatus clouds could be seen to windward, everyone looked relieved. What do you say to a bunch of greenhorns after something like that? I had no idea, but out popped, “Well, won’t THIS be a good story to tell your grandchildren!” Five nervous grins returned my smile. Later at anchor, I slept for 14 hours straight while the passengers took care of themselves. But now, in this cold North Pacific gale, the most serious menace to the boat was if the frequency and size of the breaking seas increased. Most were not breaking; it was just that one breaking wave every hour or so, during the first night and into the next morning, that concerned us. Jim and I decided that if the seas got worse, we would change our strategy and run before it, perhaps dragging warps to slow us down. That would mean we’d have to alternate standing cold, wet watches up in the cockpit since we’d be underway, and we might become exhausted and a bit hypothermic. Being “parked,” so to speak, warm, dry and (relatively) comfortable inside the cabin was much better, at least for now. As long as we kept the navigation lights on, put out the occasional Sécurité call on the radio, peeked outside when it made sense to, and kept an eye on the AIS,* which showed us if big ships were in the area, we should be okay. If the waves didn’t grow bigger, that is. And if the inertia of being warm and dry down below didn’t overcome common sense when it might be needed. Sockdolager’s windward side was taking a pounding from wave crests and the occasional collapsing wave, but the real danger, if their heights increased, was in tumbling and falling off the top of one to land flat on our leeward side. Boats aren’t meant to do that, and structural damage from a knockdown would be possible. In 1979 I was on watch steering the 72-foot wooden ketch Taormina north from Honduras to Florida, when an extremely large wave swept in, picked up the boat and slammed her down in a trough. We discovered that the steady leak after that incident was due to six broken ribs. A knockdown is when a boat goes completely onto its side, keel horizontal, cockpit in the water, as did Taormina off Cuba and the Morgan 38 in the Dry Tortugas. In a knockdown, damage to Sockdolager’s spray dodger, solar panel and other deck gear would be likely. A rollover, on the other hand, is a complete capsize, a nightmare scenario where, though a mono-hull boat with a ballast keel will eventually right itself, it’s all but certain to break off the mast. Though we felt in no danger of being rolled over, a knockdown was the main threat if more seas began breaking. Where does feeling calm come from? I can’t answer this for anyone else, but for me, it has to do with organizing my fear and pinning it down until all that remains is a small knot crouching sullenly in a dark corner. It comes from trying to anticipate the worst, and trying to be mentally as well as physically ready for it. It comes from not being surprised. Thinking through all the angles in advance. Figuring out what we can do. The only times in my life when I’ve been truly terrified or panicky came when I felt trapped and recognized my helplessness. Once, when I got trapped in a small room after a gas heater blew up and singed off my eyebrows and some of my hair, I went into a blind panic. The other times happened when I was a passenger in cars or buses being driven way too fast on steep, narrow, winding mountain roads in rural China, where no one spoke English. I closed my eyes and rode it out. It may be the feeling of utter helplessness that contributes the most to fear. For me, the key to keeping calm is finding the Here is something we can do. So, back to heaving-to. Why did we have such a problem with fore-reaching? We have no way of measuring wind speed, but estimate it was a solid 35 knots and probably no more than 40, which is not unusual for a North Pacific gale. Sockdolager has since hove-to perfectly using only a deeply reefed mainsail, in other situations with more wind and less wind, so the problem wasn’t the wind. It was the seas. Vertical walls of water slammed into us in that gale, and knocked us off course rapidly and repeatedly, preventing the boat from re-assuming the ideal 45-60 degree stance off the eye of the wind. No matter how we tried to keep Sockdolager’s bow up to the wind, the next wave was too steep and came too soon to allow her to recover. There was nowhere else she could go but sideways into the troughs. We needed to find a better strategy, such as more windage aft and a better way to force the bow to windward in these conditions. When Jim hove-to off New Zealand in 40 knots and 10-15-foot seas, the boat behaved perfectly under double-reefed mainsail alone. She didn’t heel too much and kept the bow at 50 to 70 degrees off the wind. Here is a video taken after the worst of that gale, which also occurred at night. 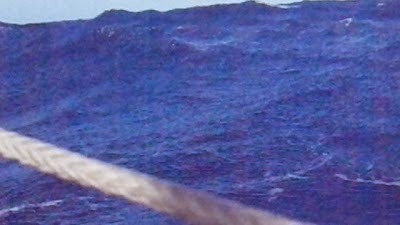 Winds are about 30 knots in this clip, with seas 10 to 15 feet and one larger one at the end (shown in the still image below). 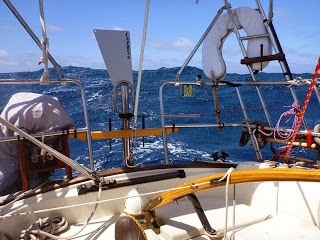 Sockdolager was on starboard tack and maintained her position pretty well, as you can see by the masthead windex. The difference was that the seas off New Zealand were well-spaced, so the boat could keep her bow up without fore-reaching, and the "slick" stayed amidships and was more vigorous than off Oregon. Now let’s look at footage from both videos side-by-side. Compare the steepness of the seas (Oregon is on the left, New Zealand on the right) and their frequency. The seas off Oregon were much closer together, and steeper. The masthead wind indicators compared seem to bear out our contention that the steeper seas made heaving-to off Oregon much more difficult. In addition to not allowing the boat to recover its position between seas, the "slick" to windward off Oregon was not as pronounced as it was off New Zealand. We found that putting the two situations side-by-side made it easier to compare them, and by watching it several times we could see quite a difference in the seas, both in wave period and steepness. 1. Relatively few people have actually tried it in oceanic conditions that would call for it due to heavy winds and/or breaking seas, and therefore don't really know how their boats would behave in such conditions. Practicing heaving-to in light air is good, but expecting the boat to behave the same way in heavy wind and seas is unrealistic. Have other options for sail configuration available. 3. Some whose boats have modified fin or full keels with a cutaway forefoot (front part of the keel) and a combination of high topside or cabin top, or lots of foredeck windage, say that their boats will drift off position and fore-reach. The Dana 24 fits this configuration, and with its high bow, sail area is rarely needed forward of the mast. Fore-reaching is an acceptable tactic as long as seas are not breaking and you have enough sea-room. An excellent description of the mechanics of heaving-to and fore-reaching can be found on Beth Leonard and Evans Starzinger’s web site, as a PDF file, here. 4. Full-keeled boats with large rudders and comparatively low topside windage will heave-to more easily and without the need for special sails, but not necessarily in the same way under all conditions. Lin and Larry Pardey advise using a parachute sea anchor when heaving-to in certain situations, especially where sea-room is an issue. (See Storm Tactics.) Wind and sea conditions made things far more variable than we expected. There appears to be no one-size-fits-all solution to heaving-to; different tactics are needed depending on conditions. But any boat with excess windage or that’s loaded with deck toys is probably not going to heave-to in textbook fashion. Heaving-to is also a useful steadying tactic for resting up, changing sails, riding out a brief squall, waiting for adverse wind to subside, dealing with a broken shroud, stopping for an emergency situation such as a sick crewmember or a person overboard, having an offshore swim call if it’s warm, cooking and eating a meal more calmly, or just taking a break from sailing. We’ve done it often, enjoying the respite it gives from the constant heave, roll and toss. In extremely light winds where big seas are running, most diaphanous sails such as drifters and spinnakers would shred themselves in the back-and-forth heavy rolling. Even a full mainsail will damage itself. It sounds counterintuitive in such light wind, but we hove-to in Sockdolager using a double-reefed main and the staysail sheeted in tight, which kept her pointed in the right direction instead of spinning in circles. It meant being able to take advantage of zephyrs to inch us across the Pacific through three weeks of light air and calm. This means a lot when the boat carries limited amounts of fuel. Most people think of storms when they hear the phrase heave-to, but that's just one of many reasons, and for lots of sailors the least likely reason to be encountered, for learning how one's own individual boat behaves. The trick with a Dana 24, as with any boat, is that conditions will dictate which combination of sails and gear is needed, and that owners should just get out there and experiment. It took us awhile to learn our boat's sailing characteristics as well as how to heave her to. The main thing we learned is that the Dana has enough topside and cabin windage to make using a sail forward of the mast unnecessary most of the time. That's why, in lesser winds that haven't the power to force the main back and the bow up, she will sometimes fore-reach, especially in a chaotic seaway. We hove-to dozens of times, mostly to get some rest in squally, rainy weather. Fore-reaching was never an issue with well-spaced seas. The Dana is neither unusually bad nor unusually good at heaving-to. Statements that “a Dana won’t heave-to” are inaccurate, because they do, and quite nicely most of the time. The variability in wind and sea conditions will determine the combination of sails needed. The stronger the wind, the less sail you’ll need, especially forward of the mast. It's also possible that our cockpit weather-cloths, solar panel and arch provide some compensating windage aft. We finally reached San Francisco after waiting out two more gales, one happily at the dock in Eureka and another at anchor in Drake’s Bay. It felt like a triumph equal to an ascent of Everest! Larry’s suggestion with the Morgan’s Cloud example was to heave-to but also use a Galerider (a type of sea-anchor made of reinforced webbing) streamed at an angle off the bow to help keep the boat pointed better upwind. We spoke to the consultant at Hathaway, Reiser and Raymond (makers of the Galerider) and he had not heard about the way Morgan’s Cloud streams their Galerider off the bow. He could not recommend doing that with their product, but we bought one anyway with exactly that intention, to try it as Morgan’s Cloud did, in case we ever encounter those conditions again. We haven't used the Galerider yet, nor have we been in conditions that would have given the backstaysail enough of a test to say it's indispensable. But we suspect the combination would do well in those short steep seas, and are glad we have this as an option. Below is our storm sail inventory: the backstaysail, a storm trysail and a storm staysail, all with bright-colored visibility patches. Made by Carol Hasse's Port Townsend Sails. One of the best references on the web, about heaving-to vs fore-reaching, by Beth Leonard and Evans Starzinger, a PDF file. Advice on heaving-to, from the comprehensive web site by Morgan’s Cloud. A good, non-technical explanation of how waves are formed, told from a surfer’s viewpoint, can be found here: Wave Basics. *AIS: Acronym for “Automatic Information System,” it’s a recent built-in receiver on many newer VHF radios that makes collision risk assessment much easier. An AIS receiver shows the name, position, speed, bearing and closest point of approach of other ships, in scalable areas ranging from one to twenty miles. We called it our “poor man’s radar,” but the problem is most fishing boats and small yachts don’t have AIS transponders, so their positions aren’t broadcast. Ours is receiver only, but we learned something from friends in the South Pacific who were very pleased with their AIS transponder. “Big ships see us automatically and change course without us having to call them on the radio,” they said. Next time we replace our VHF we’ll get one with an AIS transponder. Twenty tons of info, Karen & Jim. Your excellent adventure advice keeps a-coming. I echo your use of Pardey's Storm Tactics writeup. Was always tucked in my journal though every storm and every boat were different. My first long ocean passage was across the (Terrible) Tasman from Newcastle, Australia to Opua, NZ in a 32 foot gaffer (Atkins Eric). Postcard sent on arrival simply read: "19 day passage. 10 days hove-to. All well on board." Over 8 years of ocean sailing (in other boats), we hove-to to repair sails or gear, sleep, slow hull speed, cook, protect against breaking waves, let storms blow by us, reduce risk of sail or equipment failure and sometimes all of the above. A brilliant tactic - beyond storms. Saved sanity, gear, probably lives. GREAT blog post & seamanship, sailor friends. 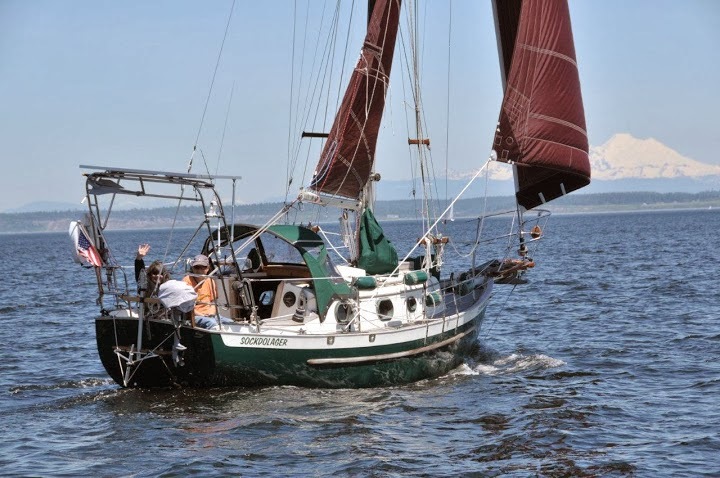 I have been following your blog since before you left Port Townsend and very much enjoyed meeting you both at anchor in Clipper Cove, San Francisco. Thanks so very much for the posting on heaving to. I found it very informative and very useful. You did a masterful job at breaking down a complex subject into small easy to understand bite size chunks. You answered many of my sailing questions as well as dispelling many Dana 24 myths. Great and didactic post and videos. You did a public service to the sailing community in general, and the Dana 24 community in particular. Here is a funny or odd tidbit, out of habit I almost always heave to on a starboard tack :) Like right of way means anything out there. This is a great post. I met a guy with a Dana out of Bellingham who was convinced it wouldn't heave to. I have done it more than once on a Dana and tried to convince him he could and explain how. I hope he reads this post. I hope everybody reads this post,very exited to read your book. Thanks for your comments, everyone. Yes indeedy, there has been more than a modicum of in-house debate among Dana 24 owners and prospective owners, over whether or not a Dana can heave-to. After receiving more than a modicum of inquiries about it, we decided it was bloody well time to answer the question, at least as far as our own experience has been. But heaving-to on starboard tack! Whoa, subtle. Hadn't thought of that one, let us know who wins. Actually, we've found that most big ships at sea we've spoken to have been extremely willing to alter course significantly to avoid "that little sailboat." The trick is you have to talk to them and tell them what you're doing. I doubt if that'd work in confined waters like Puget Sound, though. Great post, thanks for the detailed info and videos. Thanks for not only the tactical info buy your descriptions of the gale offshore helps level set those who haven't had that experience yet. I think it takes brave folks to also tell everyone how you were feeling at that time as well. Lastly the picture of all your storm sails up was enlightening for me to think about the reflective parts of them. I've not seen that before. Hope to see you out in the sound sometime, not in a gale though. I am looking for an offshore capable boat that also has the ability to be trailered/stored at our home in Tucson. These are two divergent requirements I know:) Anyhow, my question is what was your average # of miles/day when offshore in "typical" conditions? A Dana is trailerable, though right at the upper limit of what's practical. There are some other trailerable boats that are offshore capable, but that'll take some sleuthing on your part. As for daily runs, we call it good if we make 100 miles per 24-hour day in moderate downwind conditions. Upwind all bets are off. Great information and fun to read. In as much as the Dana 24 seems to suffer from heaving-to goblins in steep seas, does anyone know if this other similar sized offshore vessels do not have this problem, because I would like to get a boat that is known to point high enough when hoved-to so that I dont have to have as big an adventure when I get caught in steeps seas, although if I do, I will have a great story to tell like you guys. I was thinking maybe of a Cape George 31 or something like that. Thanks. It turns out that a lot of cruising boats have the same problem in such conditions, of not keeping the bow upwind--even the ones with full keels. We were amazed after discussing this with friends. With its 21-foot waterline, the Dana does exceptionally well in most conditions, but to counter the shove of short-period steep seas you might need a much, much larger boat that doesn't get thrown around as much. It's really a question for a naval architect. Having hove-to many times in all sorts of conditions for all sorts of reasons, we felt the Dana was no worse at it (and sometimes better) than most other boats. Come back and tell us your story one day! As far as the use of the galerider device, [caveat: I am a newbie sailor], the theory seems a bit flawed to me, in these ways: First, how long is the sheet that you let it out on, as it is dangling here and there it could stream up under your rudder and get tangled in the prop; or is it real short? And if it is real short, what keeps it on the proper side of the boat, if there is a proper side. I imagine you would want it to be on the windward side, yes? That would seem to help pull the stern away from the wind and point the bow upwind, right? But it would also tend to just either plaster against the hull on the windward side if the sheet was short, or else, if the sheet was long, it would go under the keel, and pass out the leeward side of the boat and then pull the stern more into the wind. Actually, it seems kinda hard to predict where it would pull things, but as I said, I am just figuring out how to sail. But I already love the idea of an easy to heave to boat. Just tell me if anyone out there can, if you have a boat that heaves- to well in steep seas, or is this a problem for most boats? And I will get the book Storm Tactics. But the first tactic is definitely this: Get a boat that heaves to really well in all conditions. Properly hove-to in high winds, a boat will drift slowly downwind at (hopefully) less than a knot, which, if you had to launch a sea anchor from the bow, would be enough to keep it from streaming under the boat. If the boat fore-reached and fell off the wind, the sea anchor, or in our case Galerider, would stream at an angle, exerting a windward pull on the bow when it tried to drift downwind. That's what Larry Pardey says in Storm Tactics, and also what the 50-foot Morgan's Cloud does in the Arctic when they need help keeping the bow up to windward while heaving-to. If we were hove-to on the port tack, for example, the bow would want to fall off to starboard, and therefore, the rode would be streamed from the bow's port side. We haven't been back out in gale-force conditions at sea where we got to try our Galerider, so can't give you a definitive answer. The length of the rode would depend on the size of the seas; in drogue or sea anchor deployment it's accepted practice to keep it "dug in" one wavelength away, and that's probably what we'd try to do. Best advice is to go out yourself and practice heaving-to in all kinds of conditions, starting in light winds up to, say, 25 knots, just to see how the boat behaves. I don't know if it's possible to find a modern cruising boat that heaves-to well in all conditions AND gives the turn of speed and maneuverability most of us also want. If I were you I'd be looking for a boat that first sails well, then behaves reasonably in challenging conditions at sea. Every one's a compromise. Good luck in your search, and let us know what you find. Our readers would be interested to know. I see from your description that I made a wrong assumption about how the current would effect the sea anchor. So you seem to be saying that the boat will drag it, rather than the waves and current streaming it under the boat to the stern. Do I understand correctly? Alternatively,, if you put up a mini stern mounted mizzen or "jigger" sail , as this Dana owner did : http://www.ventspleen.com/?p=514 , I guess it creates enough push on the stern to keep her pointed straight. Do you know about this? I am still putting the Dana 24 at the top of my list, along with the Cape George 31, the Bristol Channel Cutter and the Pacific Seacraft 34. But the Seacraft 34 has wheel steering, and I want the simplicity of the tiller system, it seems so elegant and efficient. Those are some mighty nice boat choices you have there. 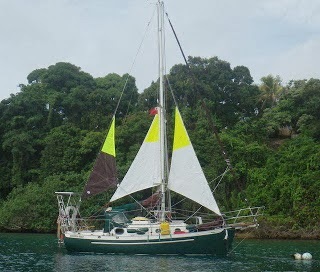 Benjy's blog that you mention is very good and gives many innovative ideas, including the "yawl" riding sail. We liked that idea, but with the wind vane steering gear and solar panel aft, it didn't seem like the solution for us. Still, it would be fun to know if anyone else tries it and how they like it, and especially, how it's rigged for higher winds. In most oceanic conditions when you're heaving-to, the wind is blowing so hard that there's usually no worry about drifting over the line attached to your sea anchor or drogue. Remember, those act like water anchors by resisting being dragged. Possible exceptions might be situations in which currents are very strong in the opposite direction from the wind, but it would create chaotic seas, and we never encountered that. You would, however, want to pull in the overboard gear once the wind dies down. If this is the level of detail in the book you are working on (out?) I will def be buying it. Thanks, Chris. It's not out yet, but we will keep everyone posted.